Norman Grubb was the son of an Irish Anglican clergyman, WWI soldier, Cambridge man, missionary, Bible translator, conference speaker, prolific author and avalanchine letter-writer. A gifted writer and chaotic, scattershot, rapid-fire speaker, he professed to hate pulpit-preaching. "Public speaking is my private hell," he said. "Listening to Norman preach was like trying to drink from a fire hydrant," said a friend. As a young zealot he joined the Heart of Africa Mission (HAM) led by his father-in-law, the radical pioneer missionary, C.T. Studd; and later became a disciple of revivalist Rees Howells, founder of the Bible College of Wales. So how did a firebrand for the Old Time Religion make his way into the "Behmenist Circle?" At the age of 40 he underwent a crisis of faith and took a yearlong hiatus from his position as general secretary of the Worldwide Evangelization Crusade. He found solid ground again in the rational mysticism of William Law, and through Law he discovered Jacob Boehme. In his memoir Once Caught, No Escape he writes, From Boehme I got my answer, and to this day know no writer to match him...Christ incarnated, crucified, risen and glorified is central to him; but he gathered together into one all the twisted strands of the meaning of life as no one else has. He is the last word to me. How I revelled in him and Law. I get more from a sentence or two of Boehme, amidst much I can't understand, than from whole books of others. ﻿Norman returned to his position and under his leadership the WEC and its "Christian Literature Crusade" would grow from 35 missionaries in the Congo to 2700 workers on four continents. In 1965, after 40+ years of evangelism, he retired from the mission field and embarked on a new commission. I was now free to pour myself into my main absorption - the sharing with my fellow believers of Paul’s (and my!) revelation of that mystery once hidden “but now made manifest to his saints.” (Col. 1:26) That revelation is of a total present “Christ in you, the hope of glory.” (Col. 1:27) He is the perfection in us, and we in Him are His human manifesters. He devoted his last three decades to the message that he called union life. All creation is a self-manifestation of the Creator. (Of course it is. How could it be otherwise?) Existence is a unity with God at the center. Norman's cosmology stops an inch short of pantheism - devils and human egos are air bubbles of unreality in the infinite ocean of being which is God. Disunity was brought into the cosmos by the spirit of error, Satan. The primal error and source of unreality is the illusion of independent selfhood. Human beings are only vessels, filled and operated upon by powers greater than ourselves. We are united to one of two powers - the spirit of truth or the spirit of error. In Christ the bonds of error are broken and we are free, restored to our virginal union with the Creator. In union life, there is no thought of self-improvement, no talk of "getting closer to God" or "becoming more like Jesus;" no commandments, no moral absolutes, no spiritual disciplines, because Christ lives His life in us, through us, as us. Love, righteousness and holiness come naturally, just as sinning used to come naturally. In Christ we are children of God (1 John 3:1), new creations (2 Cor. 5:17), one with God (1 Cor. 6:17), partakers of the divine nature (2 Pet. 1:4), seated with Him in heavenly places (Eph. 2:6), kings and priests (Rev. 1:6), more than conquerors (Rom. 8:37), perfect (Heb. 10:14), complete (Col. 2:9-10), holy and without blame before Him in love (Eph. 1:4), branches of the True Vine (John 15:1), vessels of glory (2 Cor. 4:7), lights of the world (Matt. 5:14), temples of the Holy Spirit (1 Cor. 6:9), filled with all the fulness of God (Eph. 3:19) and saved to the uttermost (Heb. 7:25). It is not we wanting to feel Him, or know Him, or love Him; that is still self wanting something; it is just He. We lose sense of ourselves. HE IS! And so I just recognize HIM living and working in place of me. It is beyond feeling and desire; it is just HE. Self-improvement is both a sin and an impossibility. I, as a human, do not become the power or love or wisdom of God; I merely contain Him who is all these, and everything. I saw Him, the Spirit, not a power or influence, and not someone who does something to me and changes or sanctifies me, but the Person in Himself come to show me where I am forever, on the cross and in the tomb with Jesus, and that He has come forever to live His own life in me. He is the one who thinks in my mind, sees through my eyes, wills in my will, loves in my heart, and acts through my body. You're not you; you're Christ in you.﻿ He who has seen you has seen the Father. But what an exhilarating life is ours to be pioneers of The Truth in a world distracted by conflicting philosophies, all with some ray of truth; but to us is entrusted the knowledge of the central sun, the unsearchable riches of Christ. For many years Norman was a member in good standing of the evangelical community and was invited to prestigious pulpits and big conferences. But now that he was no longer an organization-man but an independent, he became less cautious in his language, and it gradually dawned on the professional clergy and their auxiliaries that they had an infiltrator in their midst. This was not the Official Christianity handed down by the Church Fathers - this was Gnosticism! He never called himself a gnostic or used the term "gnosis." 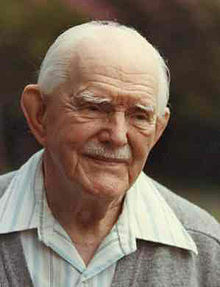 He favored the terms "conscious inner knowing," and "living conscious union." He liked to refer to his friends and followers as "knowers." "You are not your body," he would say. "All you are is a consciousness - a knower, a lover and a chooser." He was certainly not a creedal gnostic and knew nothing of the demiurge, Pistis Sophia or the archons, but church leaders could read between the lines. Heresy hunters wrote him up as a false prophet. Cornerstone Magazine labelled him a pantheist. Others lamented that "a once great man of God" had gone astray in his latter years. His 1986 appearance on Robert Schuller's "Hour of Power" was perceived as his final break from orthodoxy. He never responded to attacks and remained unquenchably cheerful, sometimes beginning letters to friends with "My Dear Fellow-Heretic..."
To allegations that he was "trying to start another cult," a friend wrote a delightful response titled "Another Cult." When heresy hunter David Hunt devoted a chapter of his bestselling Seduction of Christianity to Norman Grubb, and accused him of preaching a gospel of "self-deification," Norman said, "Good advertisement. Well-written." In the end, even ministries he had labored with for decades closed their doors on him. The Christian Literature Crusade started inserting disclaimer leaflets in his books. The venues got smaller until banishment from official Christianity was complete. 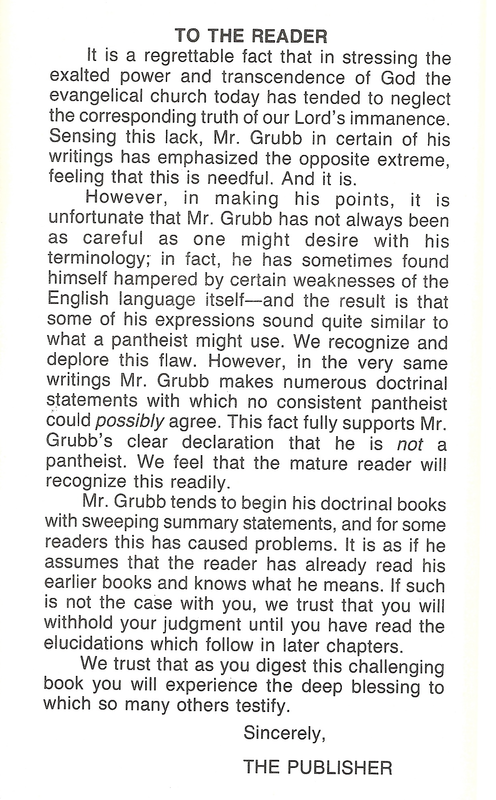 Norman Grubb was no speculative theologian: his theology was autobiography, his doctrine was personal testimony. And that is Gnosis. There was nothing arcane, occultic, spooky or theurgic about it. Somehow you've come past the realm of just knowing about this Person called Jesus Christ and He is real to you. That was the glory and perhaps the uniqueness of Norman Grubb: he could explain the notoriously complex theosophy of Jacob Boehme in terms that even the simplest soul could understand.